Did you know that Marx Food is going to postpone their voting poll thingy? In a word, WOW....this looks fantastic. Thanks for the recipe!! Yeah, Sophia we got different chiles. I noticed when you posted yours. I think we got all different kinds. Click on my pic to make it bigger to see all the diff. names. And - yes I saw the date got moved back! WOW! I want in on the challenge it looks great! I made fresh chile sauce last year and it was fantastic. Way to go! Oh what a fun package! I just posted about a recipe using chipotle chilis in adobo sauce - it's so fun how many types of chilis there are! So lucky you got to try those spices! I was looking for dried chiles in Target and the guy took me to the canned Chili! He had no idea what I was talking about! This looks AWESOME!! I wonder if Trader Joe's had dried chiles - I must find some! 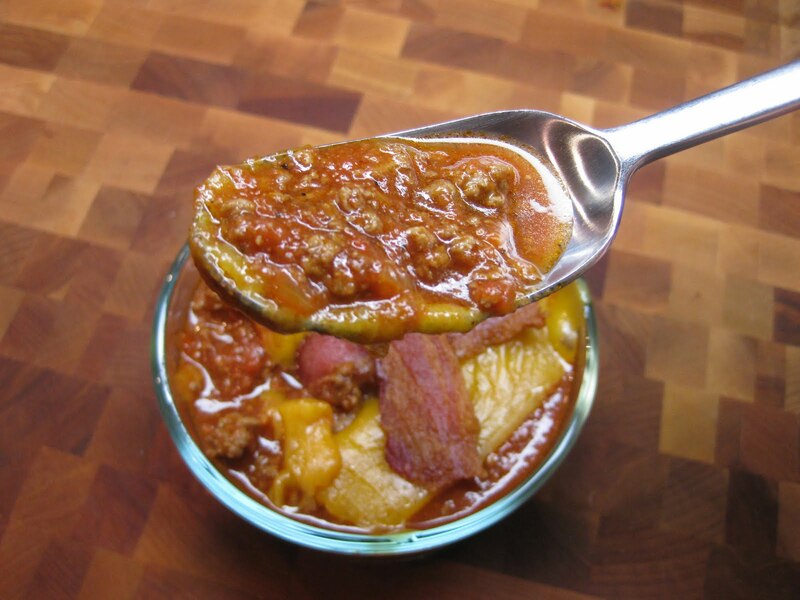 It's chili, it has cheese and it's topped by bacon...it can't get better than that! Oh my! I love this idea! And someone special in my life would REALLY love this idea!